Charles, a 20-year music teacher, holds a Bachelor of Music Education from Henderson State University, a Master of Music in Performance from Portland State University and a Masters of Science from the University of Phoenix. He is in demand as a clinician and adjudicator throughout Oregon and Washington. He has taught in both public school and privately, as well as at the college level. He was the Brass Graduate Teaching Assistant for Portland State while attending school there. He currently teaches at Pacific University and Warner Pacific College. His 25 years of performance experience includes 14 years serving in Army bands in the U.S. and abroad. His recent performances include stints with Oregon East Symphony, Columbia Symphony, the Conical Quartet, Collage Brass, and various other groups as a freelance artist. 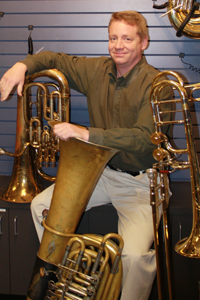 Charles was a founding member of Rose City Brass and has performed with Brass Inc, The Classical Brass, Arkansas Symphony, the Mesquite Symphony, Bravura Wind Ensemble, Garland Winds, The 296th Army Band, The 36th Army Band, and the 234th Army Band. He has studied with Wes Branstine, Gary Carper, Ed Jones, and Ja’Ttik Clark. If you have a question for Charlie, or wish to contact him, please fill out the form below. The message will be passed along to the Education Center and they will get back to you.